Be more accomplished, with subliminal messages! Pass any test, express yourself superbly, and learn languages with ease. View More. Are you debating skills letting you down? Want an effective way to boost them from the inside out? Debating is an art, a war of words in which you try to sell your ideas to an audience and rebut the views of others. The trick is to always be yourself, project total confidence, listen carefully to others, and be ready to respond. 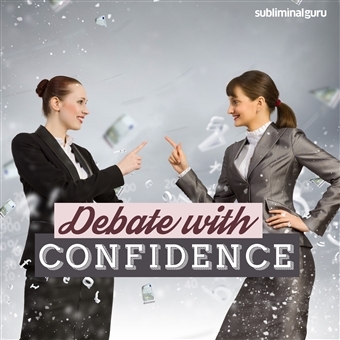 With the Debate with Confidence subliminal session, you'll unlock the key to superior debating skills! As you listen, thousands of powerful positive affirmations will rewire your mind, helping you argue with authority. You'll start to find your focus, able to get your point across with clarity and accuracy. You'll have audiences eating out of your hand, secure in your abilities to make a strong case that will always stand up under scrutiny. Download the Debate with Confidence subliminal audio now to enjoy the talents of a true debating champion. I am a naturally gifted debater. My debating skills are excellent. I have a clear understanding of the subject. I always speak clearly and powerfully. I stay calm and on topic. I research my subject thoroughly. I know how to get my point across. I get audiences eating out of my hand. I make a strong case to support my argument. I enjoy debating with others. I debate with confidence and poise. I am a debating champion.